9.17.11 - A Unique Date to Celebrate Claremont CA - September 17 2011 - 91711 Our Zip Code Day! 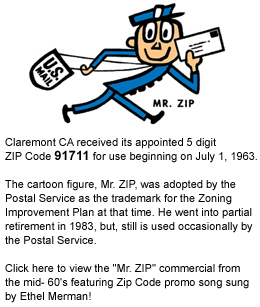 WOW ... a terrific ZIP Code Day day in Claremont! Have your mail stamped with a commemorative postmark for 30 days following Sept 17 at the Claremont Post Office, 140 Harvard Avenue (at Second Street). View map Be sure to ask for the special 91711 postmark. A memorable souvenir of this "unique date to celebrate Claremont" includes Historical Treaures Hunt to DISCOVER CLAREMONT and an incentive to visit them -- along with "Shop, Dine and SAVE" offers in Claremont, ZIPpy Treats info and a calendar of events. Available at: Sonja Stump Photography, 135 W. First St, Claremont (Village). Please note: Many special offers will be available through October and you may enter the Historical Treasures Hunt contest until October 28. Great crowd for this unique photo-taking opportunity! Click to view photos online at the Claremont Courier. In the future, it will also be on display as a huge mural on the wall just east of The Packing House. Admission is FREE TODAY (Sept 17) for Claremont residents. 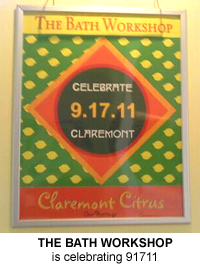 9.17.11 is filled with so many activities that make Claremont special every day -- and a few extra special ones unique to this date! $5 for 20 minutes (includes skates). 91711 Passport has 50% off offer! Features 14 artists' studios (16 artists) which fall within the 91711 zip code. Expect to see ceramics, painting, fiber arts, and more! 9.17.11 tag available at geocache site. around the area. Hosted by the Bike Advisory committee. Entertainment: 11:00am ... Village Pipers debut "Zip Code Boogie"
Chevrolet Trivia Game throughout the day on 9.17.11!! Special discount offer at the Friends of the Library Book Store. Watch talented students hang on the silks. You can try it, too! and prisoner artwork will also be on display. 4:00-6:00pm ... Party held annually at participating businesses in the Village to welcome all students at The Claremont Colleges. Check-in is at City Hall where Student I.D. is required to receive a sites map and goody bag. ZIP CODE BOOGIE (a new song written by Charolette Van Ryswyk for 91711) was performed by the Village Pipers at City Hall? View YouTube video of the debut!